Grave Ref. : I. Q. 15 . John Leslie Moore was born in 1893 at Codnor, Derbyshire. In 1901 the family was living at Market Place, Codnor but by 1911 had moved to St Edmund Villas, Sedgwick Street, Jacksdale later moving to Main Road, Jacksdale. John, known as ‘Leslie’ was the oldest of ten children comprising Annie Maud, Alfred, Olive, Arnold, Claira, Harvey, Florence Lilian, Grace Eliza and Dorothy Mavis. Leslie enlisted at Nottingham on 24th April 1915. He was aged 22 years and 2 months, gave his occupation as coal miner/hewer and home address as Main Road, Jacksdale. He was single, 5 foot 7 inches tall and had a scar and a mole under his chin. He gave his next of kin as his father George Moore. Leslie served at home in the UK until 28th August 1915 when he was posted with the Mediterranean Expeditionary Force to the Balkans. Just three weeks later he was admitted to hospital in Mudros, Greece as ‘invalided’ but the condition or injury is not noted on his service record. By October 1915 he was back in the UK at the No. 1 Southern Hospital, Dudley Road, Birmingham. After a couple of months he was deemed fit for duty and embarked for France with the British Expeditionary Force on 9th December 1915. On 26th January 1917 he was promoted to unpaid Lance Corporal and made up to paid on 20th April that year. 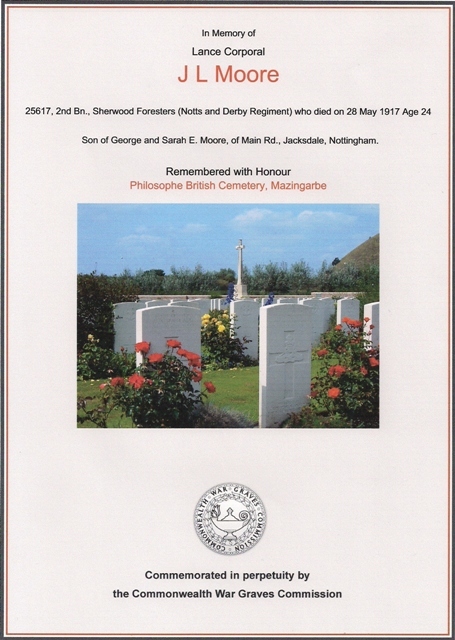 Leslie served in France for 2 years and 35 days until Monday 28th May 1917, when he was killed in action taking part in a raid on German Trenches, near Philosophe, in the Loos Salient, France. Leslie was aged 24 years. In April 1918 his articles of private property were forwarded to his then widowed mother S.E. Moore at Main Road, Jacksdale with a request that his medals should also later be forwarded to that address. He was awarded the 1914-15 Star, the British War and Victory Medals. 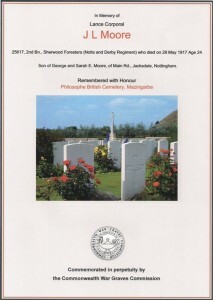 Leslie is buried at Philosophe British Cemetery, Mazingarbe, Pas de Calais, France. 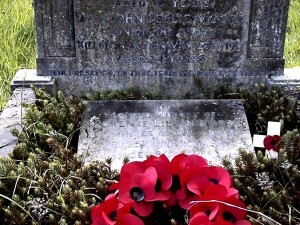 He is also commemorated on both the Ironville & Codnor Park and Jacksdale War Memorials. There is a family grave in St Mary’s Church Cemetery, Westwood. His father, George, died only six months after his son, on 18th October 1917, aged 53 years. His mother, Sarah Elizabeth, died on the 3rd July 1949.